Beautiful unissued certificate from the Ste. 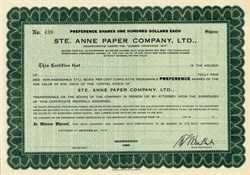 Anne Paper Company incorporated in 1925. This historic document was printed by Charles F. Dawson Limited Company and has an ornate border around it.